Slashers and showboat rock were the blissful bastards of the entertainment world in the eighties and it’s no surprise that some Einstein would bring the two together. Quite surprisingly, it came in 1980, so at the very least the film was on the ball in the slasher cliché game and had the film came out a mere two years later, it probably would have had a much different execution. In 1981, Motley Crue hit the scene and it probably would have made Terror on Tour a bit more entertaining since it surely would have imitated their style. When people use glam rock to describe the band in Terror on Tour, it’s not the hair metal Poison stuff you normally would expect (if only because it’s what is commonly remembered today), instead a throwback to the days of Kiss theatrics. Grab your guitars, chains and whips; it’s time to hit the strip. No protection needed. The Clowns are a rock band trying to make it out of the scene and into the mainstream. Their over the top stage theatrics have become a big hit and they like their tunes louder than hell. They’re still playing clubs, but their album has charted and the future looks bright. Until their zany onstage performance of decapitating mannequins may have been taken to heart by a crazed fan. During the show, a dealer is murdered and the cops are sure it was a nutty member of The Clowns taking stage games into reality. Soon enough things really get out of control as dead groupies begin to pop up after every show and party The Clowns are a part of. The police hire a con to go undercover and infiltrate their world in hopes find incriminating evidence to take one of them down. Is it a band member? A promoter? A strung-out junkie? Like a bottle of booze, The Clowns will get to the bottom of it by the time the show is over… not that they’re too worried about it. Terror on Tour is pretty much the type of film that gave the slasher genre such a bad name in the 80s. It starts out all right, but quickly falls apart in a sea of poor pacing, poor characters and an overall lack of direction. There’s no doubt in my mind that had the film had a more polished script, better actors and a higher budget that it could have actually packed a little bit of a punch. On the surface lie all the problems. The rockers are incredibly bland and for the most part, sure as hell don’t look like a quartet of anarchists who pile a ton of chicks after every gig and bury their face in a blizzard of cocaine while doing so (and while not). The dialogue is so-bad-it’s-good and certain scenes just go on too long to nowhere in particular. One minute they’re a big time out of control party band and the next they’re at their home acting as boring as the doziest slasher characters in history. For a group of supposedly greasy bastards, there is a distinct lack of leather and attitude when the makeup comes off. The Clowns aren’t necessarily a hundred percent happy doing their arm-chopping gig on stage, and that’s where the film shines a glimmer of hope. It’s true, it’s as shallow as a puddle after a quick rainfall, but at the heart the filmmakers do end up trying to capture an essence of the people in the gratuitous rock scene that extends into the equally as gratuitous slasher filmmaking scene. The band wants to play good tunes, but to get anywhere they have to conform to what is trendy at the time and end up playing things they don’t necessarily believe in. Don’t get me wrong, this isn’t a huge issue in the movie other than for a couple minutes, but it just proves the foundation for a moderate success was in place. In addition, there’s even a good ol’ fashioned “life imitating art” talk. Then there’s always that one guy in every rock band that takes the drugs too far and in this film it’s Ralph, whom I only remember his name because of this fact. Then, there’s Herb, who is the all around nice-guy roadie that can’t score with chicks. No matter, the band doesn’t mind if he dresses in their stage costume and makeup to try and score. He turns out to be the only decent character in the film. Other than Herb, Ralph and Lt. Lambert, I don’t remember the name of a soul from the movie and tops, they couldn’t have been spoken more than once or twice. I am not going to kid anyone, potential fans of Terror on Tour aren’t going to give two hoots about what I just spoke of, but the horror and stalk scenes nonetheless leave something to be desired. First and foremost, The Clowns all wear the same makeup, so the killer could be anyone, including those in their entourage who dress like them. Sadly, this isn’t taken advantage of and the climax goes down when The Clowns are onstage, which makes it impossible for any of the band to be the perp. We’re only introduced to a handful of faces (they’re not quite minor characters), so the guessing game is slim, not that we really even care. 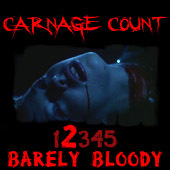 The film has a good amount of blood, but no real grue to warrant anything past a two on the old Carnage Count as the kills are just stabbings. The L.A. scene is captured nicely, except wardrobe could have benefited from that aforementioned dream of a higher budget. These people don’t look like the junkies and sluts one would place on the strip in the early eighties, merely normal people. Either way, ludes, weed and coke (no dope, they say!) are everywhere in the film and the band takes turns with the same groupie even though it’s like shooting fish in a barrel in the clubs they play in. Nikki Sixx would be proud. If anything, as shoddy as the film is, it draws an interesting parallel to how women in the fictional slasher film world are as expendable and exploitable as they are in the real life rock world. It’s actually almost a miracle that somewhere along the road, Terror on Tour wasn’t re-titled something like The Groupie Murders with a demonic guitar slicing down towards a scantily clad blonde’s throat. I’m sure it’d have done much more business that way. Media’s VHS cover has to be one of the most boring horror covers ever and as of this date, the world hasn’t relived the L.A. scene on DVD. That’s not a tragedy at all, but fans of eighties rock and bad slashers will be able to stoop to the film’s level and get some cheesy, entertaining bloodshed. Terror on Tour barely (and I mean barely) avoids the garbage rating, but if the Tour comes through your town at a bargain bin price, you may as well pick up your backstage pass right back to that cesspool of depravity… “loose women, drugs, booze. You know; the scene.” Rent it!